And then there were two. Interestingly, there used to be at least five wineries producing Syrah from this gorgeously farmed vineyard at the north end of Santa Lucia Highlands. 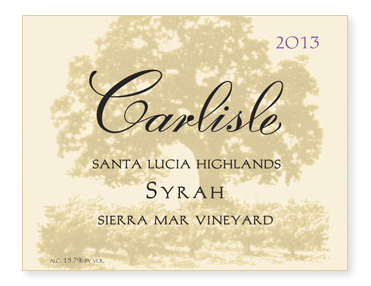 Now, however, there are only two – owner Gary Franscioni’s own brand, Roar, and Carlisle. We’re very sorry to see the others go but ecstatic to be receiving more of this wonderful fruit. Look for a significant increase in production beginning with the 2014 vintage. Picked October 9th, the must was cold soaked for five days before inoculation for primary fermentation. In order to increase mouth-feel and texture, the wine sat on the skins for 28 days before being barreled down to all French oak, only 22% new. As usual, unfined and unfiltered.